(Makati Central Business District, 7 March 2019) – Department of Information and Communications Technology (DICT) Acting Secretary Eliseo Rio Jr. will introduce the National ICT Ecosystem Framework (NICTEF) at the 1*DATA Privacy and Security Solutions Day on March 20 at the Makati Shangri-La hotel. NICTEF is a newly-minted technology direction for the DICT which will serve as the major blueprint on the future direction of the department for its initiatives. 1*DATA brings together data privacy and security thought leaders and influencers in government, private sector and professional associations. 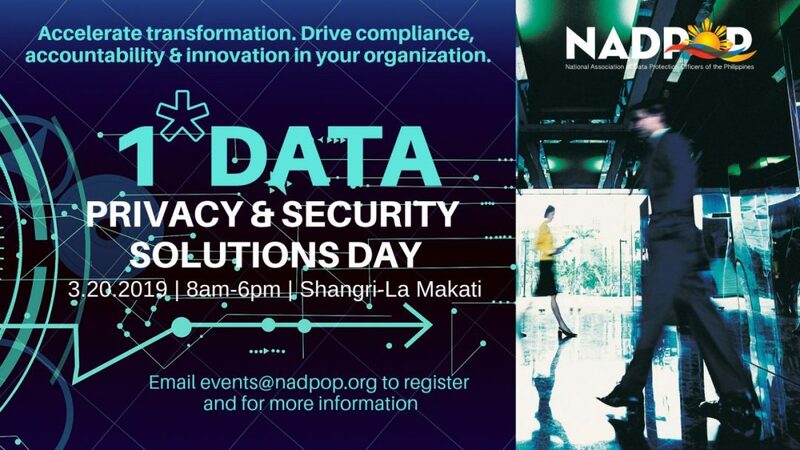 It is organized by the National Association of Data Protection Officers of the Philippines (NADPOP), which is the first home-grown association of privacy professionals in the country. 1*DATA will be held at the Makati Shangri-La hotel on March 20 from 8:00am-6:00pm. Former National Privacy Commission (NPC) Deputy Commissioner and NICTEF Consultant Dondi Mapa will reinforce this through a presentation on a Solutions Framework for Data Privacy & Security. UN Consultant Dr. Emmanuel Lallana will then unveil a Competencies Framework for DPOs, which will help NADPOP to develop initiatives that will help their membership to become world-class privacy and security professionals. Henry Aguda, Unionbank Chief Technology and Operations Officer, Chief Transformation Officer, and UBX Chairman of the Board will further highlight the importance of deploying world class solutions with his talk on the Tech of Security, which is part of a bigger discussion on The Science. Art and Tech of Data, Privacy and Security during the Plenary. 1*DATA will also see industry associations like the Infocomm Technology Association of the Philippines (ITAP) and the Integrated Bar of the Philippines (IBP) share the State of Data Privacy in their respective industries and professions. ITAP will be represented by its president Carlo Subido, while the IBP will be represented by Atty. Boyet Medina who is their DPO.